Want a data science job? Springboard is a leading provider of data science training. Hundreds of Springboard graduates have mastered data science skills, and have been hired at companies like Nielsen, Amazon, Boeing, and Reddit. Apply to the Data Science Career Track -- the first online bootcamp to guarantee you a job in data science or your money back -- and you can join them. You’ll work with your own mentor - a data science expert who knows what it takes to make it in data science. Springboard mentors lead data science teams at companies like LinkedIn, Jawbone and Coinbase. They will invest time to help you achieve your goals. This is a selective program for highly motivated career switchers, enrolling only 18% of all applicants. It requires prior experience in programming and statistics. Most people finish the course in six months if they spend 10-15 hours a week. 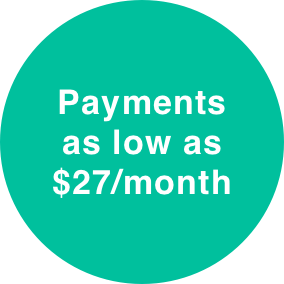 If you take financing, you’ll benefit from interest-only payments as low as $27 a month. Six months after the course, if you don’t get a data science job, your tuition is refunded. Learn with a structured path, using a rigorous, curated 200-hour curriculum, built by experts from IBM, Cisco, and Pindrop Security. Master the skills and tools to break into data science -- everything from machine learning, statistics, Python, SQL, Spark, Hadoop to advanced data visualization tools. Self-paced, flexible course. Spend 8-10 hours a week, and complete in 6 months. Pick up an industry-recognized certification without quitting your full-time job. Get 1:1 career advice from industry experts with experience on top data science teams. Benefit from a personal career coach to help with interview prep, resume review and job search strategy. Benefit from exclusive employer partnerships with the best brands in data science. Get a data science job within 6 months of graduation, or get a 100% tuition refund. Springboard is the #1 data science bootcamp with our alumni rating us 4.9 stars (of 5) on CourseReport and several Data Science Career Track graduates have already gotten started on their data science career. If you’re looking to join their ranks and invest in your new data science career, look no further.